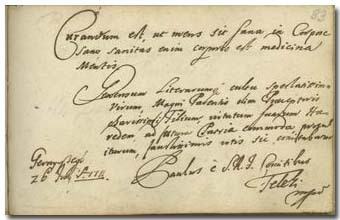 Pápai Páriz Ferenc, Album amicorum p. 83. Curandum est, ut mens sit sana in corpore sano, * sanitas enim corporis est medicina mentis. Generosum literarumque cultu spectatissimum virum, Magni Parentis olim Praeceptoris charissimi Filium, virtutum suarum Haeredem, ad futura Patriae commoda procul iturum, faustissimis votis sui comitabatur. Paulus è S. R. I. Comitibus Teleki mpr. * A paraphrase of Juvenal, Saturae 10.356: “orandum est ut sit mens sana in corpore sano”. This same quotation is also used by Herman Alexander Röell on p. 111. Let us take care [or: let us heal] that we might have our healthy soul in a healthy body; * for the health of the body is the medicine of the soul. Let this excellent and noble man, eminent scholar, son and heir of the virtues of his great father who had been my teacher, be accompanied by my best wishes, in order he could serve in the future the benefit of his fatherland. Count Pál Teleki of Szék was born on January 8, 1677 in Sorostély (Alsó-Fehér county, today Soroştin), a son of Mihály Teleki (1634-1690) and Judit Veér (1631-1707). First he learned in Nagyenyed (Aiud), then he went abroad to attend history, law and philosophy at the academies of Frankfurt an der Oder (1695), Franeker (1696), and Marburg (1697). He also visited Berlin, The Hague, London, Oxford, Cambridge, Paris and Switzerland. After his return in Transylvania, he became the curator of the College of Kolozsvár (Cluj) and of the Reformed Church. He supported the college and the students on foreign stipends; he was called scholar and father of the fatherland. In 1709, towards the end of the Hungarian War of Independence, he became a partisan of Prince Ferenc II. Rákóczi. In 1700 he married Kata Vay (?-? ); their son was General Ádám Teleki (1703-1769). Died on September 13, 1731 in Kendilóna (Szolnok-Doboka county, today Luna de Jos). A copy of his published funeral sermon is also kept in our library.